I’ve talked some about how clear the skies are out here on the Farm, making it easy to see everything going on in the sky. We certainly benefited from that last night,when DearFarmerHusband saw a green flash in the sky. I called it a comet, he called it a meteorite, but the American Meteor Society called it a fireball and it was seen from southern Ohio all the way to Georgia! I didn’t get to see this one, but I saw one last year, about this time. Quite an impressive sight, I must say! I’ve said it before and I will say it again, if you want to spend some time star gazing, watching clouds or maybe, just maybe catch a falling star, you should check us out!! We’d love to have you! Here is more information on the fireball, from the American Meteor Society site. I did it! I’ve committed to the NaBloPoMo for November! This means I’ll be writing a new post every day here! Keep you eye out, I can’t promise the newsworthiness of them, but they’ll be here. Like this one…It’s short…I spent the day cleaning cabins and am beat! 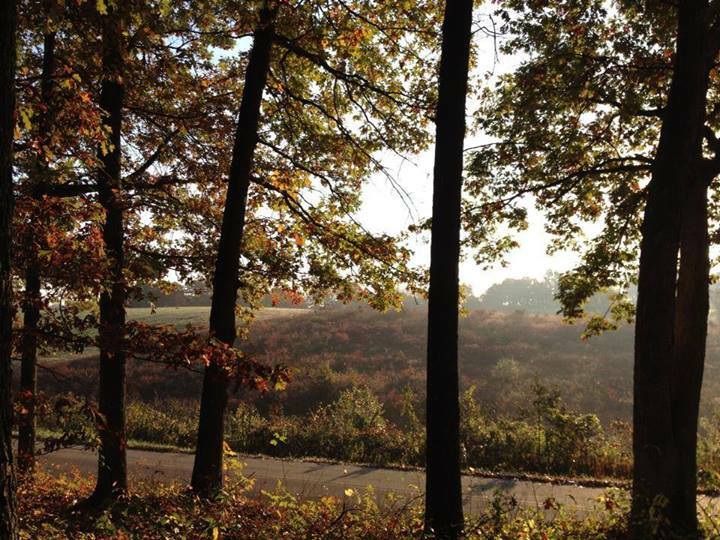 I will leave you now with a Fall picture taken here on the Farm. Come check it out for yourself, we’d love to have you! Most of my previous professional life was spent working as a Case Manager. I’ve worked in Child Protection in SE Ohio, did Disaster Recovery after Hurricane Katrina in Mississippi & was an Employment Consultant to adults with special needs in Florida. As different as these all were, they all had one thing in common. They all started with an accurate assessment of the client’s needs, resources available to them to meet these needs and the resources still needed to do so. Since we’ve moved back to the farm, it seems we have been burning through valuable resources, time, money, energy…sanity, but not accomplishing much. All it once it hit me, there was a tremendous loud pop-which was me pulling my head out of the sand, the single most valuable lesson I learned in my professional life which needed to be applied to my personal one…..a good long look around. No great surprise why it hadn’t occurred to me to do an assessment. The outlook could be pretty bleak, and what would be needed to “rosy” it up, pretty monumental! But here goes…. We have 80 acres remaining of what was once an over 200 acre working farm. A place which was covered with various livestock that provided financially for my grandparents, my dad & his older brother. A farmhouse which my grandmother used to create a comfortable home for the family. Thanks to the farm, my dad’s family ate and paid bills when so many people in this area went hungry and lost everything. However, now the farmhouse is gone, the hills are covered with fields that we struggle to keep mowed and most of the outbuildings and barns that weren’t lost in a big fire in 2000, are filled to brim with remnants of generational hoarding tendencies (Guilty!). Don’t get me wrong, moving back home from out of state has given us so many opportunities to be involved and close to our children as they launched into adulthood. Being fortunate to be involved as they married (2 of them on the farm), searched for and bought the home of their dreams, and…and…had our first grandchild, Miss Madelyn Marie (or My Sweet Little M&M). We’ve also been available to help Jim’s sister settle his mother’s estate and be a support as she struggles with her own ongoing medical needs. We’ve also been fortunate to build the Pleasant View Cabin business and take it further than my dad ever would have dreamed. We’ve done so much work to both cabins and have so many more projects we want to do. There are so many ideas we are sorting through to make better use of the largest resource we’ve been given, land which has been in our family for 4 generations that is ours free and clear. We’ve been blessed with so many who have chosen to come along so far, our precious guests of both the Pleasant View Cottage and White Pine Cabin who appreciate our efforts and seem to really understand what we are trying to accomplish. Your support means so much more to us than you will ever know! We welcome you to come along with us on this wild ride, please pull the safety bar to the full upright locked position and keep your hands & feet inside the car at all times! As Charles Kuralt used to say at the end of his “On the Road”program (one of dad’s favorites). Up ahead the road is bending, I wonder what is around the bend. Life As A Playlist or…It’s beginning to look……. a lot like Christmas down here on the farm! Got the cabins all decked out and now trying to motivate to get our own home ready! Ohhh..the snow..makes her look so festive!! 1) Here Comes Santa Claus, by the Mills Brothers. This is kind of an old one, but it is a great one! 2) Snoopy’s Christmas by the Royal Guardsman. When I was little, I had this on a 45, man I’m old! 3) Tiny Tree Christmas by Guster. Never had too many Tiny Trees, having grown up on a Christmas Tree farm, but hey, it’s a cool song! 4) Celebrate Me Home by Kenny Loggins. 8) Go Tell It On The Mountain by Dolly Parton. Love me some Dolly, I do! So, hope you and yours have a Happy Happy Holiday Season! C’mon down and see us, we’d love to have you! 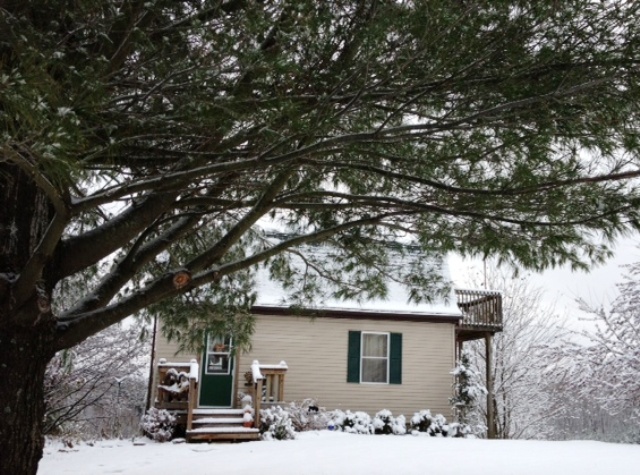 That White Pine-oneer Spirit….you got it? 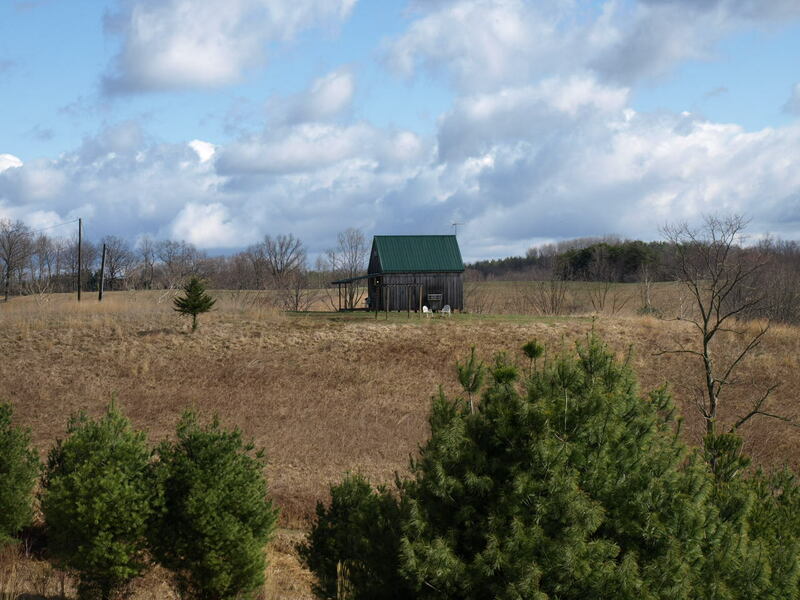 The White Pine sits at the crest of a hill over our farm pond. It is is lovely spot with lovely views, the sunset from the front porch is amazing! The breezes blow freely over the hill, without big trees to block it (or the view). Perfect for lovers of fresh country air and warm sunshine on their shoulders. 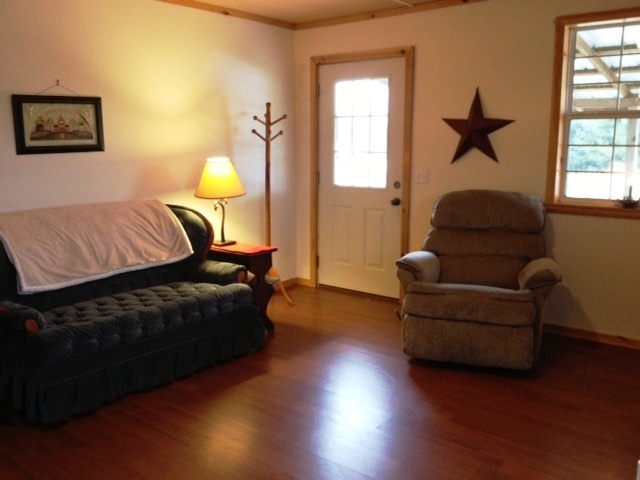 For most of us in the family, the White Pine is the favorite of our 2 cabins. 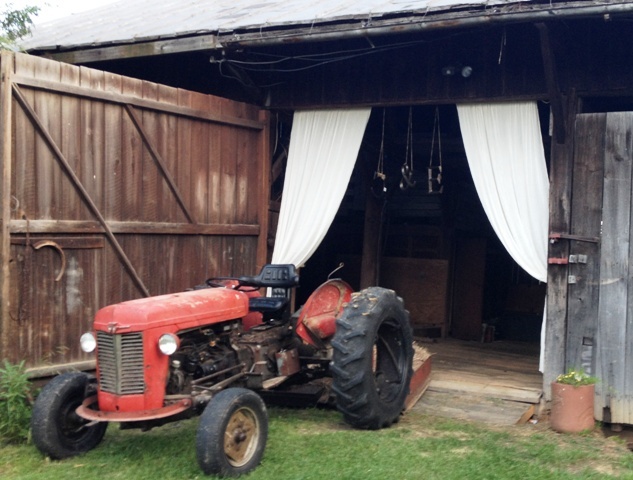 For my, it is my favorite because it was the last big project my dad tackled before we lost him, so I see it as his last labor of love for the farm he adored. 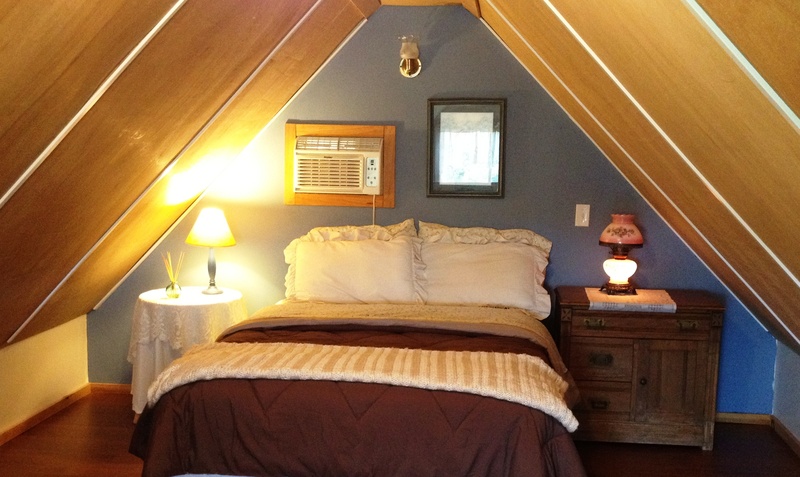 The inside is new, clean and neat (as is the Pleasant View Cottage), but it also has a warm, sweet spirit that seems to fill each and every corner. Who best enjoys this special place? People who truly enjoy being together and want to be as close to one another as they can. People who come to the Hocking Hills to spend time with those who mean the most to them, and appreciate a clean, comfortable, warm and cozy spot to do so. People who travel with budget in mind, as the rate is less expensive than most of the hotel rooms in the area. 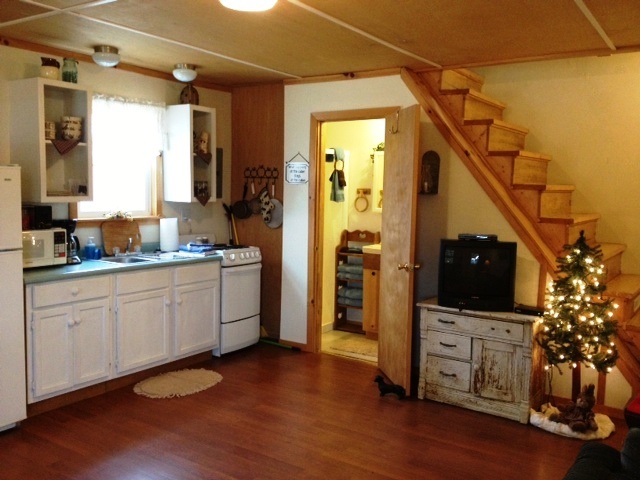 There is also a full kitchen, so you can do all of your cooking in the cabin (saving even more money!). We’ve also had more guests this summer stay in the White Pine with their children, bringing along an air mattress. Sometimes they need some extra bedding from us, sometimes not. Doesn’t matter, we are glad to accommodate! A look at the White Pine’s booking calendar for this past summer shows there are plenty of like minded White Pine-oneers who appreciate our efforts and this special place. 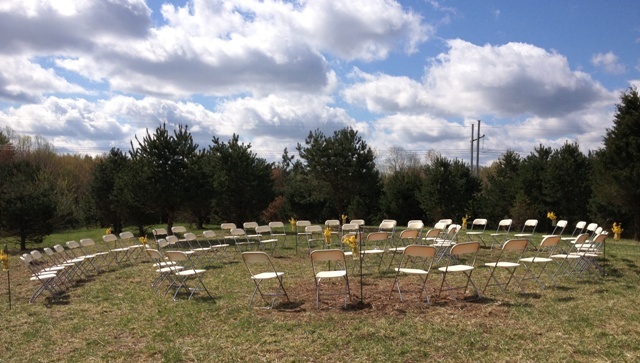 So, what about your and yours, do you have that White Pine-oneer spirit? If so, we’d love to have you!! Life as a Playlist…..borrowed patriotic version! This article I enjoyed on Mental Floss recently is right up my alley! Thought you all may enjoy it as well!! Happy 4th of July extended holiday weekend! 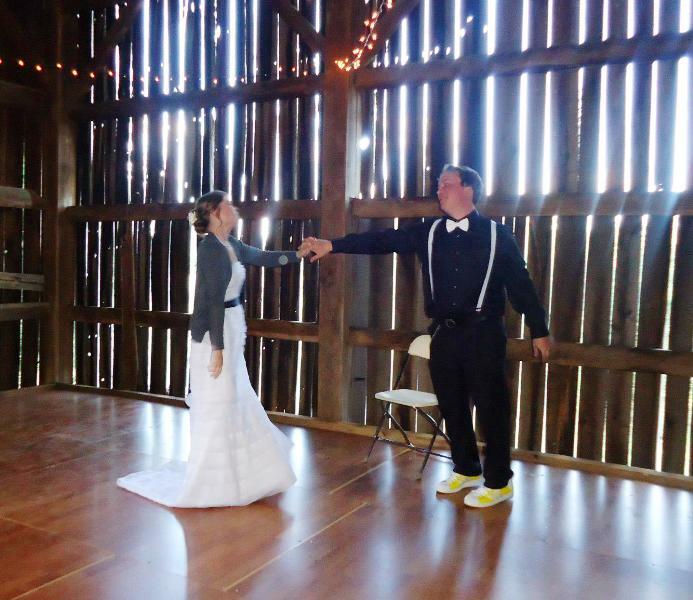 Since the beginning of October, all 3 of our kids have gotten married in Farm Weddings, 2 of them here at Hocking Hills Farm! 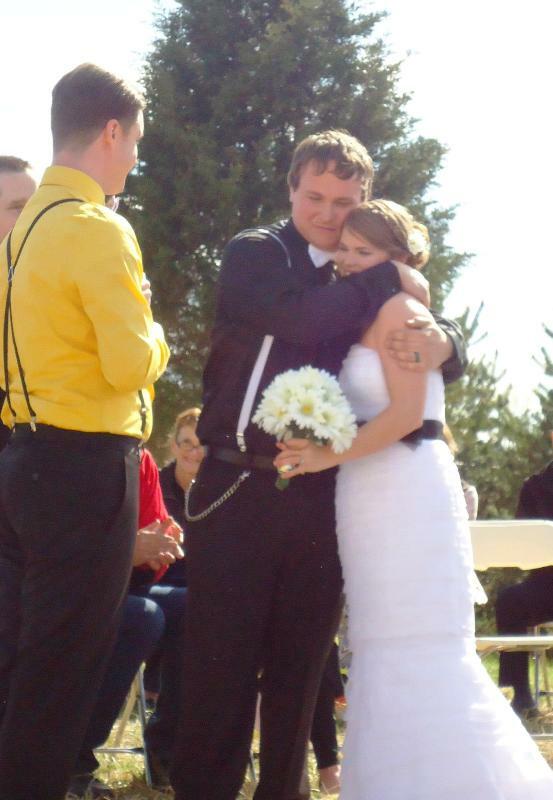 The first wedding in October, was that of our oldest son, Claude, who married the love of his life, Rachael, at her grandparent’s farm in Lancaster. I think they are about as cute a couple as can be! Don’t you? The seating was a mixture of kitchen chairs. Yeah, I have to admit, most of them belong to me and came out of various storage barns on the farm. (Yeah, I know I have a problem..). Emily’s brother, Gary, made the arbor the day before the wedding!! He built if from maple trees gathered on the farm. On the corners, he used grapevines to make it look as if they were used as binding to hold the arbor together. This picture doesn’t do it justice! I need to get some better ones up on Flickr! Here is a close up of one of the vintage games. Very appropriate, don’tcha’ think? 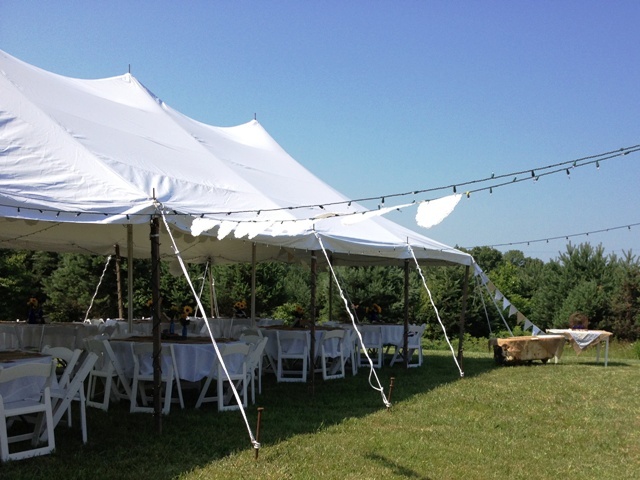 Here is another shot of the overall of the reception site. Yes, that is an old cast iron clawfoot tub. It was filled with ice and used to hold a variety of beverages. We tried to have cold drinks everywhere…where ever we could fit some sort of container, it was filled with ice to hold drinks! We made the pennants from a variety of old fabrics and burlap. The others, in the foreground were made from doilies. 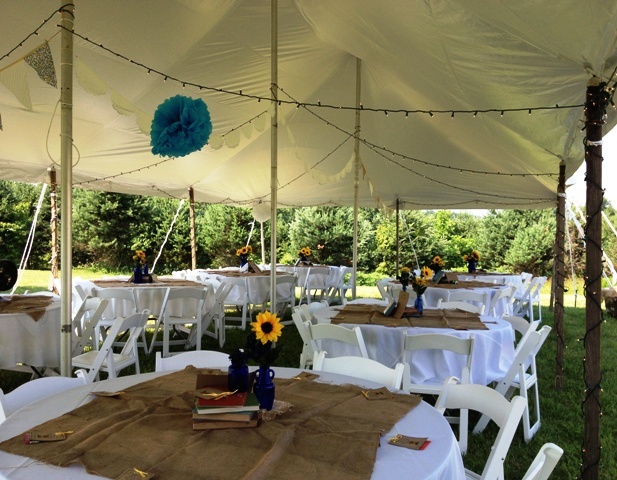 The tent came from Chillicothe Tents for Events. They were very reasonably priced and a delight to work with! 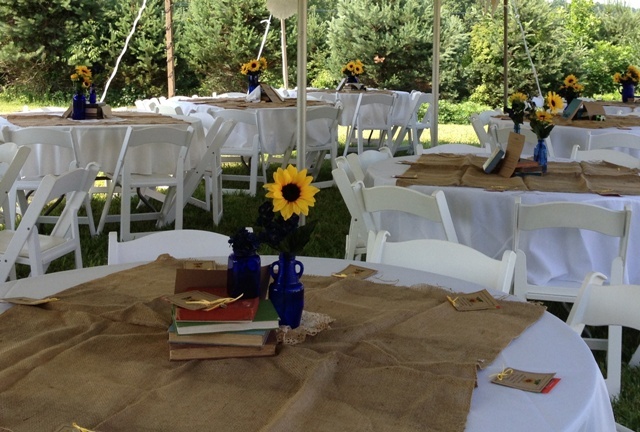 The tables and chairs were from Personal Touch Party Rentals, who were also great! 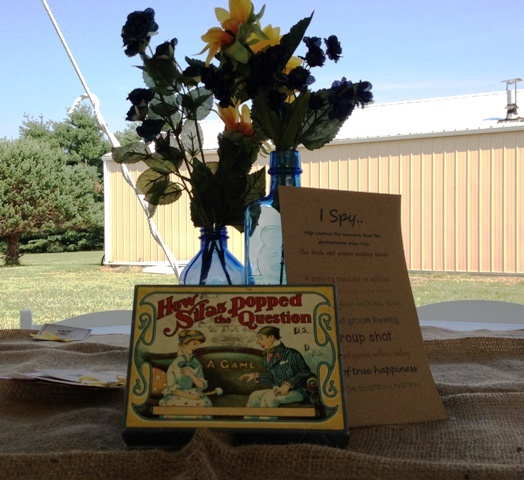 Emily and Clayton also used the barn in their wedding, but in a little different manner! They decided to do pictures before the ceremony and used the barn as a photo op and most importantly, as the place where they saw each other for the first time before the ceremony! Here is it all decorated up for the big moment! 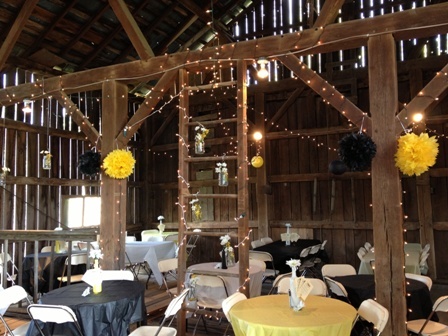 These weddings actually went smoothly enough that we are looking into renovating the barn and maybe doing weddings in the future. What do you think? 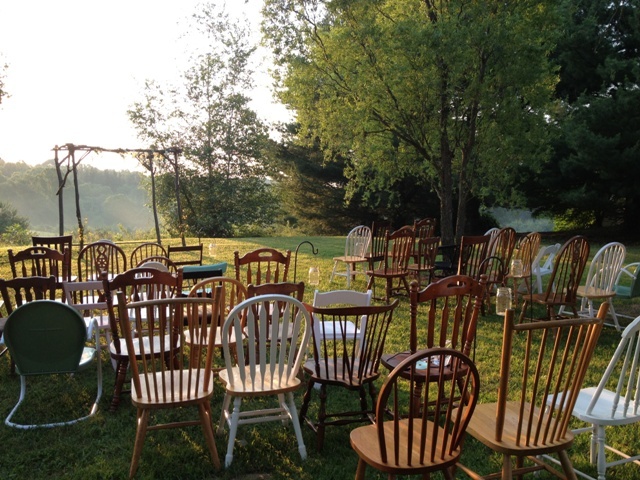 Do you need a location for your rustic wedding? 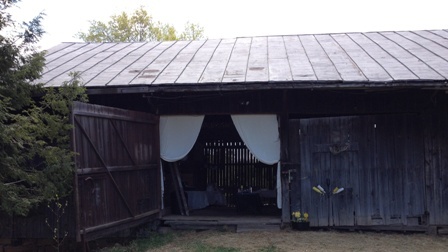 Give us a call or email us~We’d love to have you come on down to the farm and get hitched! If you wanna know what we are up to, give us your email and well keep ya posted!